BURGERS AND BARBIE$: DESSERT OR DISASTER? Our minds were set at this point... but if you're wondering, here's their menu. 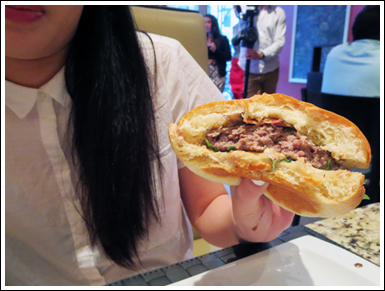 For all the burger aficionados out there, I’m sure you’re familiar with burger week and what to expect. This year is only my second participating in the festivities (I was in the Philippines last year soaking up the island sun), but let me tell you, the first annual Burger Week is not even comparable to this year’s. Now that Burger Week has gotten much more exposure, not only from the general public, but from the burger vendors themselves, this event has definitely skyrocketed. Add to that the ever-growing social media outlets, along with the “free” burger promotions from PayPal, then you’ve got every burger lover’s dream come true (well, for me, at least). But enough about that... let’s talk burgers! So I mentioned the 1.5-hour wait right? If it weren't for the picture taking, I'd say this wait would've been unbearable, but I was determined and hungry (but, when am I not? ), so there was no way I was walking away from this! Definitely. Worth. The. Wait. 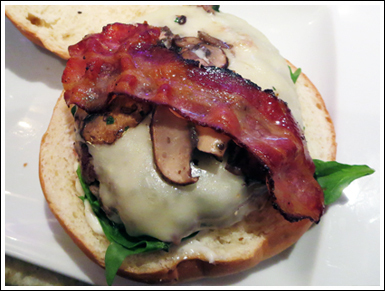 Everything in this burger just married well: arugula, balsamic glaze and bacon... need I say more? There's no wonder Toma Burger Addiction was voted the Best Burger in Toronto, and the fact that their buns are made in-store is just the icing on the cake! If you're looking for something filling and delicious, it's needless to say, you must stop by Toma Burger Addiction. 4.5 stilettos... Bravo!